Now Klawock is pretty far south in Alaska, sitting about equidistant between Anchorage and Seattle. But the rest of the state, while not quite as sizzling, has been in the grips of a serious warm wave. In addition to Klawock, at least five other locations set monthly high temperature records according to an analysis by Alaska weather watcher Rick Thoman. The warm weather led organizers to cancel the Tok Race of Champions dog sled race, which takes place about 250 miles northeast of Anchorage. Organizers said that the “unprecedented warm weather” had made “trails unsafe for Mushers and their dogs by this weekend.” This marks only the second time the event has been called off. The heat didn’t stop at the border, either. Record-setting warmth spread over western Canada and the Pacific Northwest as monthly records fell across British Columbia, Alberta, the Northwest Territories, and the Yukon. And not to be outdone by the 70s in Alaska, temperatures topped 81 degrees Fahrenheit in Quillayute on Washington’s Olympic Peninsula and 79 degrees Fahrenheit in Seattle. Both are all-time March records. The spurt of of warm weather has been ushered by what meteorologists call an omega block. It happens when an area of high pressure camps out over a location, forcing the fast flowing river of air that is the jet stream to go around it. On a weather map, it looks like a fancy horseshoe or, if you’re a Grecian alphabet stan, the letter for omega. No matter how you describe it, the pattern keeps warm air locked in over the location under high pressure and is a classic setup for breaking heat records. Heat is forecast to keep the region roasting into next week so it’s possible more records could fall. If this were an isolated incident, no big deal. But no weather happens in a vacuum anymore, especially in the rapidly changing Arctic. 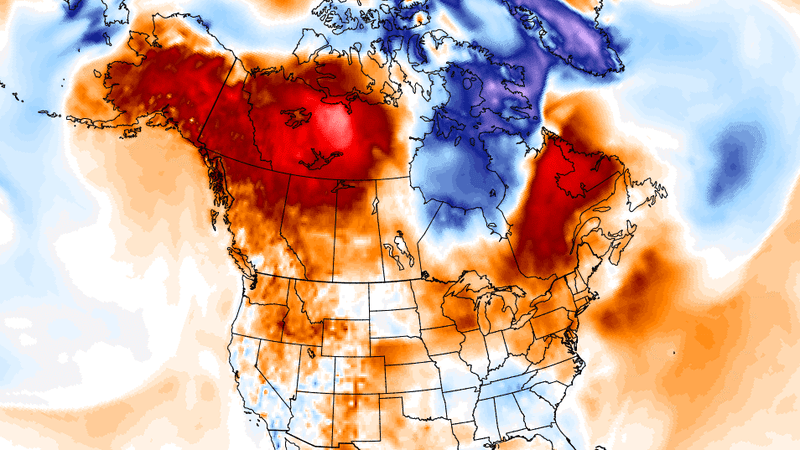 Alaska just had its third-warmest winter on record according to data kept by the National Oceanic and Atmospheric Administration. The heat extended to the Bering Sea, which saw its second lowest concentration of sea ice in February, trailing only last year when ice all but disappeared (Arctic sea ice as a whole saw its seventh-lowest maximum extent this year). The Arctic is warming twice as fast as the rest of the planet, and hasn’t been this hot in millennia. This week’s heat wave is symptomatic of the much larger shift afoot driven by carbon pollution. And it’s far from the worst impact we could see in the coming years.